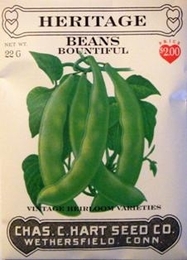 Previously known as Green Bush Bean #1 the name "Bountiful" was chosen in a contest in 1897. First prize was $25.00 (a considerable amount at the time). This popular green bean produces abundant yields of excellent quality, stringless pods 6-7 inches long an bush plants that grow 16" tall. For highest quality and yield, pick pods when young (4-5 inches long). Beans prefer warm, dry soil so it is best to wait and plant in Late Spring. Plant seeds 1-2 inches apart in rows 2 1/2 to 3 feet apart. Cover seed with 1 inch of soil, well pressed down. Germinates in 6-10 days depending on soil and temperature conditions. For continuous crop plant every 2-3 weeks until mid-summer. Bulk Heirloom Bean seed available. 70-90lbs of Heirloom Bean seed needed per acre. Average Heirloom Bean yield per acre - 172 bushels.